We need to take more risks. It sounds like a cliché, but it’s the plain truth. As the social media microscope is trained on us without reprieve, having space to take risks is increasingly rare and while we’re busy being safe we neglect opportunities – however brief – to step where it’s not expected of us; someone is always watching and a video of a misstep can go viral before we know it. So, it’s easier to be busy being safe. Safe is absolute garbage. It’s an illusion we afford ourselves from a place of inert reluctance, lulling us into complacency while assuring us it’s okay to be there because everyone else is. Through the constant bombardment of a hyper-realized ‘normalcy’ created through social media platforms (i.e. Best Day Ever! posts), safe is the mainstream we feed ourselves when some small part of us wants to rage against the machine. We’re discouraged from taking risks by using scary labels. What was once considered a midlife crisis might now be generational disengagement and part of the social culture, painted for us too large to find a way around or through but small enough for us to take away a measure of guilt for being part of the problem. The message is that it’s better to be safe than speak out for fear of saying the wrong thing and bearing the brunt of commentary backlash. Everyone knows that what happens on the internet lives forever. This autumn I took a risk and launched Longhand, a digital platform on which to write about things I love and in a manner that best fits my voice. Longhand is not monetized, won’t be a place for harsh criticism, and will be as transparent as I can make it. Do I risk coming across as a cheerleader? Sure. I can’t put mind to that if I want to focus on what’s important to me: growing a platform that supports those who are trying to put their best foot forward. This is who I am. Where does that leave this site? Well, it’s changing. There will be more opinion-editorial here, and also (I hope – again, taking a risk) critical content on writing and the industry/industries I’m affiliated with. Complacency does us a disservice. Even the smallest step moves us forward. I like being safe. I have a mortgage to pay and would like, one day, to take a vacation somewhere warm where I can lie on a beach with a cocktail in hand. I also have a responsibility to the larger narrative in which risk plays a part, and I need to take those steps – even the smallest of steps – to help us move forward. So despite a craving for safety, I’ll push myself to take those risks. That beach might have to wait a little while longer. Meanwhile, keep an eye on Longhand. There’s risk there, too, only it has better camouflage. The term to mansplain is described as a verb “(of a man) explain (something) to someone, typically a woman, in a manner regarded as condescending or patronizing.” Merriam-Webster has mansplain listed as one of the words they’re “watching”, indicating its current use is changing. Ultimately, the action behind it has been part of our landscape for years and continues to be something we encounter with enough regularity to justify creating a verb. Sad, but true. I have been mansplained to more times than I can count. In my mid-to-late twenties I worked in automotive repair. For clarity, my job required technicians explain to me what was wrong with a car so I could estimate the repair and translate it to the customer: I literally had men explaining things to me daily, some with respect for my existing knowledge and others not so much. Customers mansplained their own car repair to me, others were angry I knew more about their car than they might. Some women found it difficult to understand I had knowledge of cars because they didn’t. It was a mixed bag of sexism, ageism, and education. For the past ten years I’ve worked as a copywriter for businesses in wine and written tourism / lifestyle articles about wine, with a focus on British Columbia. I continue to have a lot to learn about the subject. My experience includes copywriting (bottle labels, websites, newsletters, technical sheets), winery business operations (tasting room, office administration & finance), production (harvest and cellar work), and consumer/tourism article writing for print and online. I have a broad understanding of new world wine businesses, specifically in this province. I know enough to ask informed questions and make fair observations based on my current knowledge. Yesterday a peer mansplained something to me on a social media platform and in doing so appears to have missed the point of my message. At first I asked myself if I saw this as mansplaining because of a project I’m working on, and perhaps my lens was a little more focused in that direction. I looked at the exchange of comments, their nature and flavour, and tried to get a read on who was engaging and how. Nope: this was mansplaining. I commented that an international brand demonstrated a better understanding of my need to engage with them than some local businesses, and over a period of time. The larger message was about how an industry communicates and perhaps our local BC wine community had some growing to do. Did I know, as a professional writer, that the company I queried is larger than many locally? Yes. Was I aware that the company likely has a larger team to respond more quickly and professionally, better than some locally? Of course. Am I comparing the experience directly? No. I posted my comment to illustrate a point: the growing BC wine industry which I support wholeheartedly and often without financial compensation can do itself a disservice by not engaging with those who advocate for it. Yet somehow despite my years of working in and for this industry, a fellow had to mansplain about it to me. To use a colloquialism: I just can’t even. I know there are women in my network who have experienced and continue to experience mansplaining, sidelining, and other actions (or inactions). I’m here to support you. I have your back. We need to be there for each other. If you need to, please connect with me or someone else in your circle who will remind you of your value contribution. For the record: I know Bollinger is a large organization and probably has “way more people doing admin so they can respond and tackle these types of things” than many of the BC wineries I query regularly. I stand behind my statement that “I’m still waiting to be added to some BC winery email lists despite making several requests, some for years”. At least four of these are BC wineries with larger operations. Some make 60,000 cases of wine per year and others produce hundreds of thousands. BC wineries: please add me to your media email list, because I’m tired of asking and one day I might stop. The sentence begins with a series of assumptions (the reader is in a democratic place, has the ability and want for good writers and good leaders), and includes an agreed upon definition of ‘good’ in relation to ‘writers’ and ‘leaders’ with a not-so-thinly-veiled layer of morality. A ‘social contract’ assumes the reader is part of a type of a (likely privileged) society, participates in it, and understands the role they play. Further, there’s an assumption we want to improve: on our participation, our status, ourselves as people along that scale of ‘good’ for themselves and the world in which they belong (the immediate and greater). A reader can infer a lot about the writer from a seemingly simple sentence presented as opinion editorial. Recently I had opportunity to briefly discuss my inherent assumption of the social contract (thank you, Christine & David), that there is one, and how I use it as a lens through which to view my participation and the engagement of others. The conversation was challenging, but not a challenge of my ideas and perspective; it required me to ask questions of myself and in doing so helped me to better see my own lens (read: bias). As a writer, my continued development requires an awareness and it’s something I struggle to remind myself of. While it’s part of our social contract to engage with each other and our leaders (political, employment, community), it behooves us to do so constructively (another term loaded with assumption). On my new writing platform I’ve written about leading with heart (my friend Sandra Oldfield) and I subscribe to general concepts of leadership as touched on by poet and author David Whyte. A strong element of ‘good’ (assumption) leadership is the willingness to be vulnerable, allowing space for those around you to do the work they’re meant to do and, in doing this work, provide breathing room and growth opportunities for those in positions of leadership. It’s akin to geese flying south, each taking turns to lead; if one remained in the leadership space, it would be exhausted and the whole flying V would fail. Geese are emblematic of offering that space, of showing their vulnerabilities (“hey, I can’t do this alone”), of asking for help. From small businesses to larger corporate organizations, good leadership can make or break its workplace culture and the culture within which the business operates. I have experience with all aspects along this spectrum, from great leaders in small businesses to poor leaders in larger ones and vice-versa. One common fault with poor leaders is an inability or reluctance to see success in others as their own. One universal strength in great leaders is the value they place on the successes of their team, as individuals and a larger group. Basically, good leaders give a damn about the people around them. Part of my social contract as a writer involves engaging with my surroundings, looking for, and seeing, these differences. At present my surroundings include a still somewhat fragile and relatively new BC wine industry, growing at a fast rate. It’s an industry I love and believe in, populated largely with people who work tirelessly for something they might not realize in their lifetime. Friends, acquaintances, colleagues put forward a vision larger than themselves and strive to see it – and others – succeed. That’s leadership, from the ground up. A large part of my role is to identify those people, champion for them, and help direct a small light their way whenever I can. This shining of light on the good in our industry comes with the equally important task of doing the same in the darker corners that we’d rather not speak of. Perhaps it’s part of that hard to define Canadianism where politeness obscures a need for frankness, but I struggle with how to mindfully engage these darker corners publicly – although I have an obligation (social contract) to do so. However, earlier this week I broke free of my reluctance and asked a difficult question in a very public forum. I didn’t expect an answer, although I do expect some attention be paid to it and will follow up. And so, here is the start of an open correspondence with one of the new leaders in the BC wine community. Mr. Peller, I’m a writer who pays attention to BC wine. Almost exclusively, as a matter of fact. I have been a small voiced champion of the BC wine industry for 1o years, since I moved to the Okanagan in 2007 and began to write. Like BC wine, my platform is small. And like a good amount writers I have a day job to pay the mortgage because many of those in our BC wine industry who value the contributions of people like me don’t always have the resources to support me with regularity. But here I am. My commitment to the BC wine industry is in continuing to champion the great things being done by nice people who are good leaders, and now with equal weight I’m committed to holding to task those in positions of leadership within the BC wine community who have the resources and strength to truly lead. People like you and your organization. Your new social contract with the BC wine industry began the moment the physical contracts for your recent acquisitions were signed. Please know this, truly, deeply, and hold it with much gravity. You are not alone. You have the strength of the BC wine community with you should you choose to engage with it, as good leaders. Your success can be found in those within the community you help to lead, and that happens when we’re united in realizing our collective success. Before we head down the road of any five-point-plans, we need to look within ourselves to be the community team I know is there. That takes courage and a willingness to be vulnerable. I’ve seen it in every facet of this BC wine community. I hope you, Mr. Peller, can see it too. I hope you’re willing to be vulnerable. That’s the kind of leader that can help realize the collective success of the most awesome group of skill, talent, and dedication that is within our BC wine community. I’ll be in touch. My people – well, I – will contact your people. a golden view from Road 13 Vineyards, one of the wineries included in the proposed Golden Mile sub-appellation. By international wine growing region standards, the Okanagan is young. This can be both a challenge and an opportunity: it’s not easy to be taken seriously, but it allows for a more generous playing field on which to innovate and invent. Yet to name the Okanagan as one region is misleading, particularly when there are such marked differences in soil and climate from tip (north Kelowna) to tail (south Osoyoos). Enter designated viticultural areas, or DVAs; areas designated by distinguishable geographic features. At present, the entire Okanagan Valley is one big DVA. There has been increased chatter among wine-types about whether lumping all smaller growing regions into one large DVA does good service to consumer education, the growth of our wine industry, and accurate labelling. In the current Okanagan Valley DVA, all wineries fall under the one big umbrella. Smaller producers and those with a site-specific focus aren’t permitted to list a sub-region on the label; if you grow in Okanagan Falls, you can’t label your region as such on the bottle. To include these areas (sub-regions) on the label, one would need to designate sub-appellations within the designated viticultural area. Europe has them, and California and Washington do too. For those wineries in the pro-sub-appellation camp, having one big DVA can be restrictive for marketing/labelling in a way that will truly reflect their brand. It can also be somewhat misleading to consumers drinking a bottle of wine from what we think is one area of the Okanagan Valley but which is, in actuality, made from grapes grown in another. For example, most hearty red wines are ripened further south in the Okanagan DVA. How it happens isn’t a mystery – it’s a combination of climate, degree days, and terroir. The following press release was issued today by Hawksworth Communications, announcing the first proposed sub-appellation in the Okanagan Valley DVA: The Golden Mile Bench. This is a substantial step forward in our young wine industry. 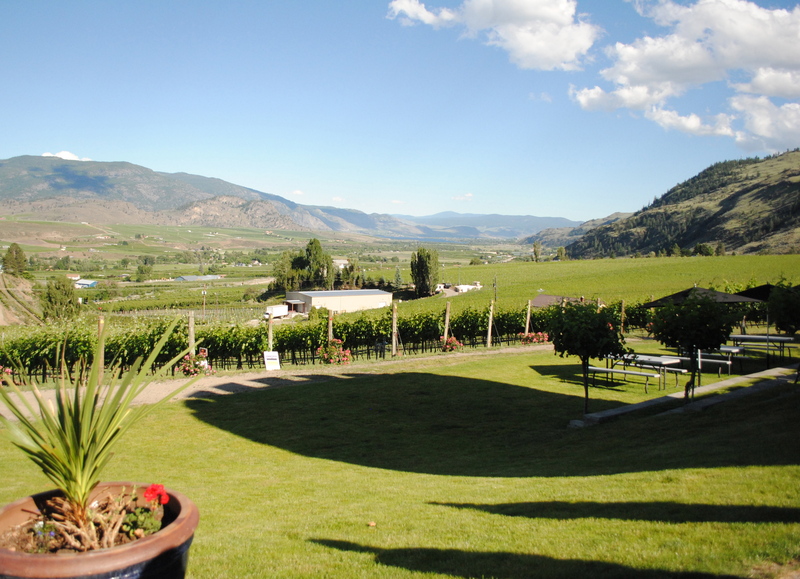 Oliver, BC (May 21, 2014) – Wineries located on the Golden Mile Bench wine growing area near Oliver in British Columbia have submitted a proposal to become the first official sub-DVA “Designated Viticultural Area” of the Okanagan Valley DVA. An in-depth scientific analysis by scientists from Agriculture and Agri-Food Canada, Pacific Agri-Food Research Centre – Summerland (AAFC-PARC Summerland) has shown the area has a combination of landform, landscape position, mesoclimate, air drainage and soil materials that make it distinct within the Okanagan Valley, contributing to the production of unique wines. A group of producers in the area have been exploring the concept of proposing a Golden Mile Bench DVA since 2009. After much discussion, debate and an in-depth study of the region’s terroir by Scott Smith, M.Sc. Soil Scientist with AAFC-PARC Summerland in conjunction with Dr. Pat Bowen, Ph.D. Research Scientist, Viticulture and Plant Physiology also at AAFC-PARC Summerland, the final boundaries were decided. Wine consultant, Rhys Pender MW of Wine Plus+ helped to compile the proposal. With the Okanagan Valley DVA comprising around four-fifths of all British Columbia’s vineyard area, yet producing wines from many different mesoclimates and terroirs, it is a widely held belief that there is a need to break this large, single appellation into meaningful, scientifically unique sub-DVAs that produce distinctive wines. Golden Mile Bench is the first such application to the BC Wine Authority. The proposal was submitted to the BC Wine Authority (BCWA) on May 20th. The BCWA will conduct consultations within the region and a vote by ballot amongst the relevant stakeholders within the proposed region’s boundaries. Once the due diligence has been completed and assuming the BCWA determines that all requirements have been met, it will then submit the proposal to the Minister of Agriculture for approval. Any enquiries about the status of the proposal should be directed to the BC Wine Authority (http://www.bcvqa.ca). A question and answer section with more details is included below. When will the Golden Mile Bench DVA become official? The proposal has been submitted to the BC Wine Authority who conduct the process as laid out in the Wines of Marked Quality Regulation. Assuming the Authority determines that the requirements of the Regulation are met, it will then submit the proposal to the Minister of Agriculture for approval. There is currently no existing time estimate. Who conducted the scientific study to determine the proposed boundaries? The boundaries were decided after in-depth analysis by Scott Smith, a soil scientist with the Pacific Agri – Food Research Centre (PARC) in Summerland in conjunction with Dr. Pat Bowen, a Viticulture Research Scientist also at PARC. Will some vineyards or wineries be excluded from the new DVA? As required under the Regulation, the area of the proposed DVA has been drawn up using a scientific basis. Some producers in the area have vineyards both in and out of the proposed DVA and some vineyards are even cut into two by the boundaries. Also, any winery who buys grapes from within the proposed DVA can use those grapes to make a Golden Mile Bench DVA designation. Will there be more sub-DVAs created in the near future? All those involved hope that this will be the start of creating a number of scientifically defined unique sub-DVAs that help tell the story of the unique regions of the Okanagan Valley. What does a sub-DVA mean and how will it appear on labels? When a sub-DVA is created, it applies to all of the vineyards within the defined boundaries. Any winery (not just those located in the sub-DVA) making wine from grapes grown within the sub-DVA could use the name “Golden Mile Bench” as an appellation of origin on the label of that particular wine.